Regular dental check-ups are important as your dentist can provide preventive dental care, check for early signs of dental decay, gum disease, and other dental conditions. The key to looking after one’s gum health is to remove plaque and calculus that builds above, on top of and/or below the gum line. Plaque is the soft furry feeling on your teeth, which is the build-up bacteria. Calculus or tartar is a form of solidified dental plaque caused by some minerals that are found in saliva. Although this process kills of the bacterial cells inside the dental plaque; the rough surface provides an excellent surface for collecting more dental plaque. As the calculus grows it will start to go below the gum line where plaque can settle on the calculus. Under the gums it makes it difficult to brush off yourself. The bacteria that is found in plaque both above and below the gum line produce acid as a by-product to surviving on foods left over in the mouth. 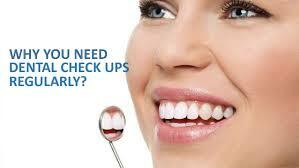 This can lead to the initial stages of gum disease – gingivitis. Gingivitis is the inflammation of the gums, this is why sometimes they can look very red and bleed when you are brushing and flossing. Gingivitis is a reversible form of gum disease, regular brushing and flossing will aid in getting rid of the bacteria causing it. If left to get worse gingivitis can lead to periodontitis. This is a more severe form of gum disease that affects the surrounding tissues that support the teeth, like the bone. Once the bone starts to shrink away we cannot grow it back, and if too much bone is lost there won’t be enough support to keep the teeth in the mouth. How can I get rid of calculus? Brushing as hard as you can will not get rid of the calculus, all it will do is cause the gums to wear away. You need specialised equipment to get rid of it. This is why regular cleans are important. The dental professional you are seein1g will remove the calculus for you in something commonly referred to as scale and clean. Where does calculus usually build up? A handy tip to remember is the most common areas that calculus build up, so that you can focus on those areas when you are brushing. Inside and outside surfaces of the very back teeth. Most of the time along the gum line. – Just remember not to brush too hard on the gum line.